Crews from Rainey Construction continued to make repairs Monday on a failed pipe that has wreaked havoc on some residents in the Village of Winifred. Work got under way on the damaged stormwater drain system on Winifred Way on Sept. 6 after two large holes and a sunken area appeared in the front yard of a Designer home owned by Carol Thomas. The holes, one of which was about four feet deep and extended underneath Thomas’ damaged driveway at 733 Winifred Way, opened up following a large-scale cleaning of the storm drains in the neighborhood. Once the work started, crews were forced to dig up large sections of the pavement and portions of several front yards and driveways. Piles of dirt lined what was left of the roadway and large, gaping holes were visible in several places. Heavy machinery was called in for use in making the repairs and crews have spent long days working on the problem so those Villagers who have been displaced can return to their homes. That heavy machinery also included a line of dump trucks in the normally quiet neighborhood that were needed in the efforts to complete the work. Workers take a close look at the damaged stormwater drain pipe that caused large holes in a Villager’s front yard on Winifred Way. As of Monday afternoon, eight homeowners had been displaced and couldn’t access their homes. Four have no potable water and two still are without sewer service. But crews hope to have the repairs completed by the end of the week, with a goal of having sewer and water services restored to the affected homes by Wednesday. Until then, residents inconvenienced by the work are being put up at the Hampton Inn & Suites on County Road 466, with the county reportedly picking up the tab. Last month, a smaller hole that opened up in the pavement on Evans Prairie Trail also was blamed on a failed stormwater pipe. 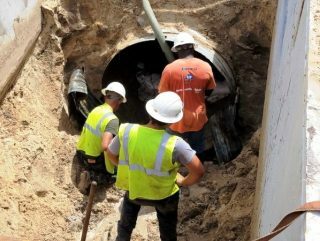 Shortly after that hole appeared, Arnold sent Villages-News.com several photos that were taken inside the pipe that clearly showed where it had been compromised below the opening in the roadway. 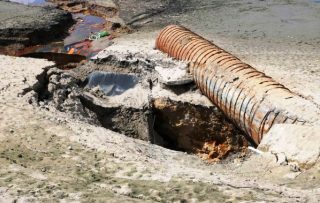 He said the county regularly schedules cleaning, inspection and repairs to stormwater pipes in Florida’s Friendliest Hometown in an effort to “prevent surprises” on the infrastructure that originally was built by The Villages and later turned over to the county to maintain. At the end of July, a hole very similar to the one on Evans Prairie Trail opened up at the corner of County Road 466 and County Road 101 – just a few feet away from a storm drain. That hole, which was located at the corner of the intersection in the northbound lane of CR 101, forced officials to close a portion of the roadway at the entrance to the Village of Summerhill, just west of the Southern Trace Plaza and across from The Villages High School, until it was repaired a few days later. And residents of McLawren Terrace in the Village of Calumet Grove still are dealing with sinkholes that have devastated their neighborhood and forced a long-term closure of portions of that roadway. Many who live in that neighborhood – concerns about property values have been expressed more than once – believe a damaged pipe that was visible after the first wave of holes opened up in February could be the culprit. A second group of sinkholes opened in May and took out part of the roadway and portions of two front yards. Two other sinkholes opened up in those yards and a fourth reopened underneath the adjoining lake on the golf course behind the homes. But crews can’t assess that entire situation until the homeowner of one of the two heavily damaged houses makes a decision about what to do with her property. Engineering experts have recommended that it be razed and the ground beneath it stabilized before crews begin to work on the pipe in question. And District Manager Richard Baier has made it clear that he will follow their recommendations in the name of keeping his work crews safe.